Ever heard the phrase ‘is it policeman proof??’. Well here is an interesting product which may help to answer yes to that question. New from http://www.camerarmor.com/camera-armor.html is something which may help to protect those expensive new digital cameras. In days gone by CSI would use medium format cameras like the Mamiya RB 67, this camera was often seen sat on top of a radiator drying out after it’s busy day in the typical British weather (rain and more rain!!). Unfortunately the digital cameras may have lots of plus points but robustness is not one of them. 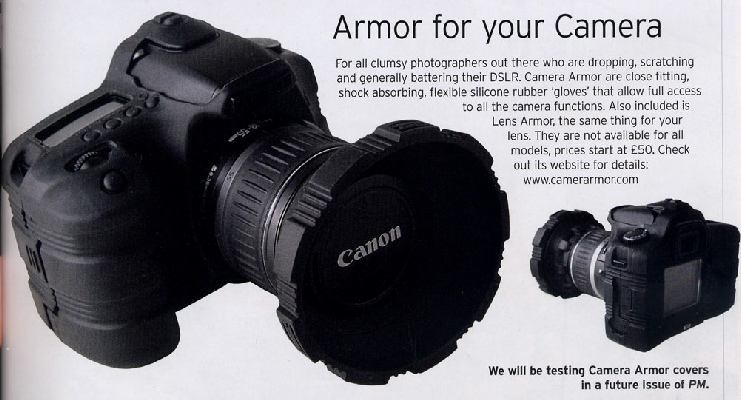 This armour is made to fit many of the most popular DLSR cameras and with prices starting from just £50.00 it looks like a bargain.